This post is 10th part of a series called Getting Started with Datatable 1.10 . First I have modified the table markup in index.php. Add a checkbox in first column in table header, which will be a switch to select or deselect all rows. Also add a delete button to trigger delete operation. Now according to markup we need to modify our JSON response on server side ie, employee-grid-data.php where we need to add checkbox for individual row selection. As we can see, we have also disabled search and sorting functionality in checkbox/ number index column. we are fetching the ids of the selected checkbox and pushing into an array, and send it to employee-delete.php for deletion as a string. In employee-delete.php , we again converting ids string to an array and deleting one by one by id. And that’s all there is to it! You can download the working code from below link, Demo is development experimental and not a production ready. Great tutorial! Thank you Arkaprava. You helped me a lot. Great tutorials! You’ve helped me get started on a project and cut my work load down considerably. 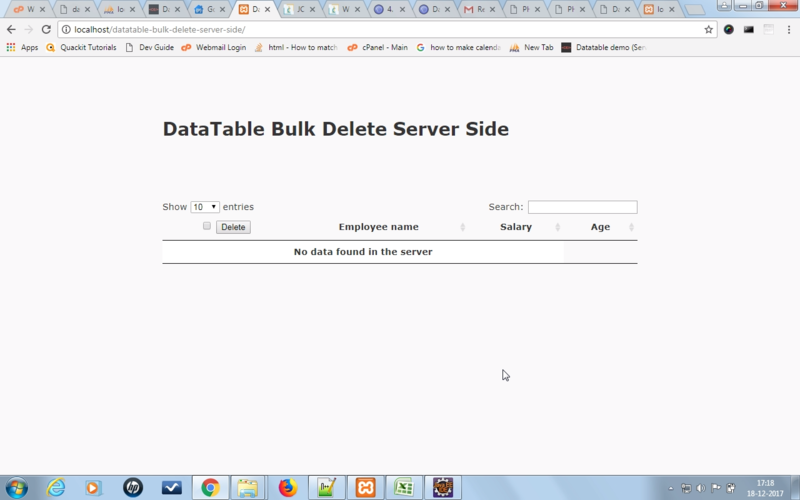 I was wondering if you have any experience with using any inline editing plugins for datatables such as the jQuery Datatables Data Manager found here https://code.google.com/p/jquery-datatables-editable/. I’m running into many issues with I believe incompatible versions of the plugins with jQuery and datatables. Thank you for the great work, very helpful!. I vote with others for inline edit/bulk update tutorial! – inline edit/bulk update [needs experience]. Then, for part 13, we can go for data statistics && cool charts! or even another tutorial series, Ajax & PHP MySQL backend to Evolutility itself. Is there a method to select all rows not only from current page? Hi do you have pdo connection for this tutorial? anyway thanks for this Great tutorial!